Stone Soup. Santa Cruz: Children's Art Foundation, July/August 2010. Print. 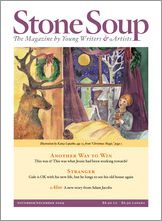 Stone Soup is a bi-monthly publication that encourages boys and girls ages 8-13 to submit their stories, poems and works of art to be published. After reviewing the latest two issues, I was surprised by the quality of work that is being created. Artisits are told to submit a variety of samples of their work and if the editors of Stone Soup like them, they will contact the artist and commision pieces for the stories they are printing. The magazine is a good choice for the tween age group because often times, as a result of being caught in the middle, they may feel discouraged or invisible. This magazine shows tweens that they can get their opinions heard, and that the work they are creating has value. It is an opportunity for young people to be recognized for their talents, which is something that may not be happening in the locker rooms and cafeterias at their schools. As a reader of the magazine a tween may be inspired to create their own pieces, or may even realize that what they are creating is good enough to share. The stories may interest them because they cover topics that are not only important to them, but are from a peers perspective. The book reviews that are featured in the magazine are also written by tweens, which lends a certain credibility to the magazine. It is very inspiring to see a magazine that features only work produced by tweens, and not the adults who are trying to sell them something. A learning activity that could be garnered from this magazine is the 'Student Book Review'. Students can write a book review similar to the ones found in Stone Soup. Variations may include letting students choose their own book or have the whole class review the same book and see how different everyone’s perceptions are. This is a very unique magazine because it is composed completely of stories, poems, artwork and book reviews written and created by tweens. It will appeal to all young aspiring artists and writers, as well as those who love to read. This magazine could also be used during silent reading time for reluctant readers or students who forgot their library books.